InaSAFE is a plugin for QGIS, so QGIS must be installed first via the QGIS Python Plugin Repository. To install InaSAFE, use the plugin manager in QGIS. Go to Plugins -> Manage and install plugins menu. Go to the search box and type InaSAFE. wait for a moment until the InaSAFE dock appears in the right side of QGIS main window. Close the plugin manager window. For more information on QGIS and InaSAFE see Introduction to QGIS. This installation method is not recommended unless you have no internet access or wish to use a specific version of InaSAFE. If this does not apply to you, use the plugin repository method described above. We make regular releases of the InaSAFE plugin and they are available at http://plugins.qgis.org/plugins/inasafe/. Simply choose the most recent (i.e. the one with the largest version number) and save it to your hard disk. Extract the zip file into the QGIS plugins directory. Depending on your version of QGIS the plugin directory is either under a subdirectory of .qgis (QGIS versions < 2.0) or .qgis2 (QGIS version >= 2.0). .qgis(2) means that the directory is either called .qgis or .qgis2. Locate the directory C:\Users\<your username>\.qgis2\python\plugins. Extract the plugin which you downloaded in this directory. It should be available as C:\Users\<your username>\.qgis2\python\plugins\inasafe\. OS X and Linux users must follow the same procedure but with the appropriate directory, ~/.qgis2/python/plugins/. Once the plugin is extracted, start QGIS and enable it from the plugin manager. 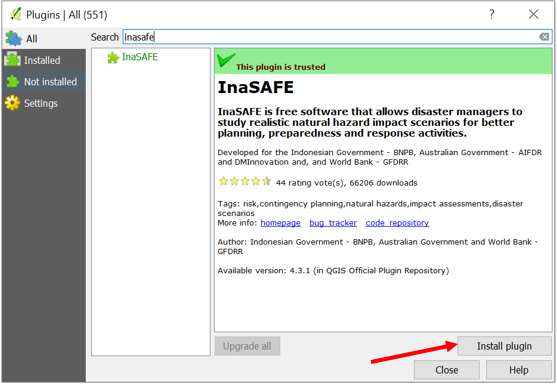 To do this go to Plugins ‣ Manage and Install Plugins and type inasafe into the search box. You should see the InaSAFE plugin appear in the list. Tick the checkbox next to it to enable the plugin. Fetch the plugin manually from http://plugins.qgis.org/plugins/inasafe/. Select your preferred version number and click Download. Delete the inasafe folder from your plugins directory. The location of this directory will vary depending on your operating system (see the previous section). For Windows users the inasafe directory would be in C:\Users\<your username>\.qgis2\python\plugins. Extract the downloaded version into that folder, effectively replacing the previous version with whichever version you downloaded in step 1.